One of the more striking images from the NFL protests Sunday was of owners standing arm in arm with their players during the national anthem. 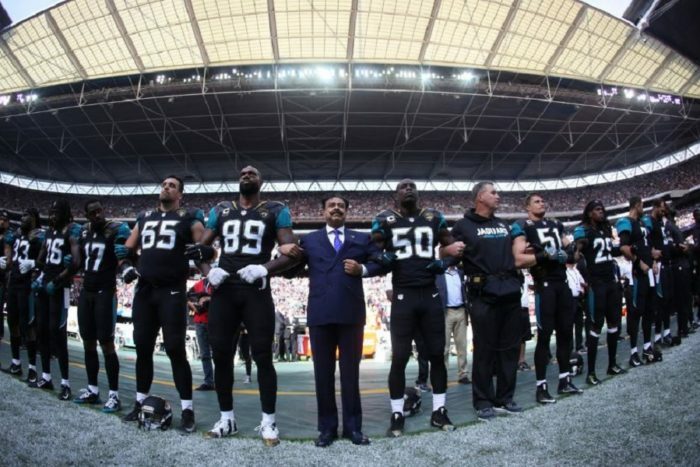 The optics of millionaire and billionaire team owners on the field in solidarity was even more powerful than the statements most made condemning the President for his verbal lashing of players who protest during the playing of the anthem. A few of these owners — the Jaguars’ Shahid Khan and the Houston Texans’ Robert McNair — were major contributors to Trump’s campaign. By an even larger 75%, millennials want their employers to speak out. Gen X workers (35-44) agree, but by a smaller 68%. Boomers, however, are less sure; only 49% say employers should be out front on issues like immigration, equal rights, climate change and others. Glassdoor’s survey, like Deloitte’s, found a high percentage (81%) of millennials “expect their employer to support groups and individuals in need in their respective communities, either through donations and/or volunteer efforts.” This sentiment is shared across all age groups, with a majority in each agreeing. Millennials especially expect their employers “to use work time and resources to advocate for positive social change, regardless of political affiliation.” This is a strongly generational sentiment: 72% of 18-34 year-olds have that expectation, falling to 56% for ages 35-44, 37% ages 45-64 and 26% age 65 or older. With millennials already the largest demographic in the workforce and posed to be the majority in a few short years, employers who want to recruit the best and most talented need to think through where they stand on these issues. “Today’s informed candidates want to work for companies that are actively engaged on topics that directly impact their lives and align with their beliefs,” said Dawn Lyon, Glassdoor’s chief reputation officer and senior vice president of global corporate affairs. It’s a difficult issue, to be sure. Taking public stands on touchy social issues — immigration for instance — can cut both ways. While it may find support among an employer’s younger workers, older ones and customers might have a very different take.